Fossilised coral reefs in the Great Barrier Reef could help scientists understand how sea levels have changed over the past 20,000 years. An international team of researchers will spend 45 days at sea, gathering core samples from about 40 sites. Described as the "trees of the sea", coral have growth rings that show seasonal variations. Researchers say the samples will also shed light on past sea temperatures, as well as other changes to the reef. Alan Stevenson, team leader of marine geology at the British Geological Survey (BGS), which is involved in the project, said the fossilised corals' annual growth rings provided an insight to conditions under waves. "We can then analyse those rings to build up a very detailed picture of what the ocean was like when they were forming, including temperature and salinity. 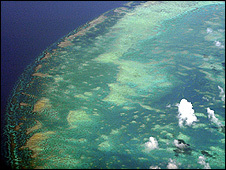 Mr Stevenson told BBC News that the Great Barrier Reef - the world's largest coral reef system - was about half a million years old. "Over this time, parts have died out... as sea levels change. Basically, corals drown when it becomes too deep for them." 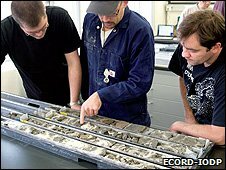 The team will collect core samples of fossilised coral that developed between 20,000 to 10,000 years ago. "We will core into a 'time capsule' of sediments that holds information on the environmental evolution of the reef since the last glaciation some 20,000 years ago," said Dan Evans, a marine geologist at BGS and science manager for the Ecord Science Operator. Researchers currently believe that there were three periods in which there was accelerated sea level rise: 19,000, 13,800 and 11,300 years ago. "By understanding more about the past, we can understand a little bit more about the future," said Mr Stevenson. The team, on board the survey vessel Greatship Maya, will gather core samples, some of which will reach down to 150m (490ft) below the seabed. The expedition would not be disturbing live coral in the world heritage site, Mr Stevenson stressed. "Obviously, it is a national park and we are in there with the permission of the Great Barrier Reef Marine Park authority. If they were not happy, then we would not be there." The expedition is being funded by the European Consortium for Ocean Research Drilling (Ecord) and forms part of the Integrated Ocean Drilling Program (IODP).